Revised versions of the accepted Papers, after strict peer review, will be published in the following Journals indexed in many reputable indexes, like Web of Science (Database: Emerging Sources Citation Index), SCOPUS, EI Compendex, IET, Google Scholar. For the indexing of a particular journal visit its web page. 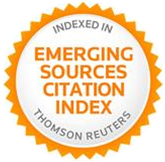 or in other similar journals indexed in: Web of Science (Database: Emerging Sources Citation Index), SCOPUS, EI Compendex, IET, Google Scholar. Extended versions of the best papers will be published in Books in Springer Verlag or in other important journals.